Dining Out: Ben Sira Hummus Bar | Pop.Bop.Shop. I hope you've been enjoying reading about my Israel trip as much as I am enjoying sharing it with you. This is the first of the six final posts about my time abroad. 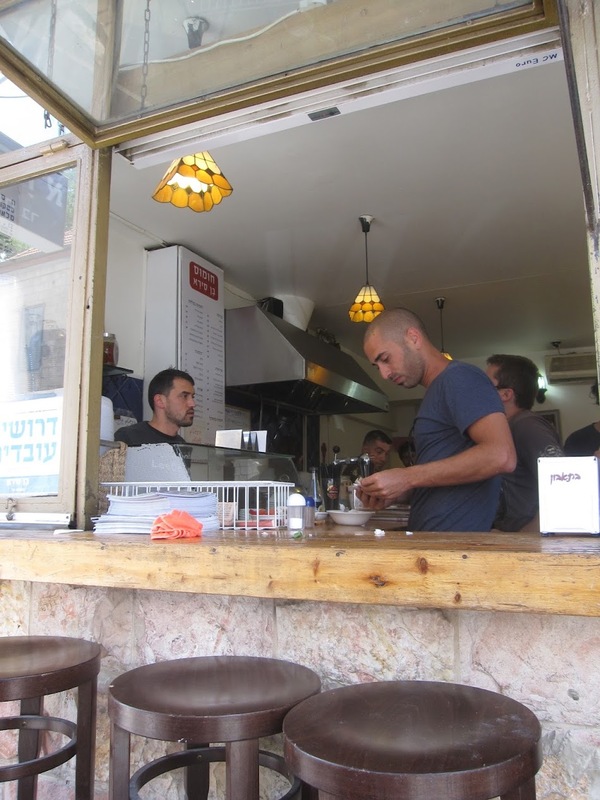 When you think of Israeli food, the first thing that likely comes to mind is falafel. The second thing, which has become very popular in the U.S., is hummus. While staying with my family in Jerusalem they took me to a hummus bar. Yes people, there are entire restaurants dedicated just to hummus. 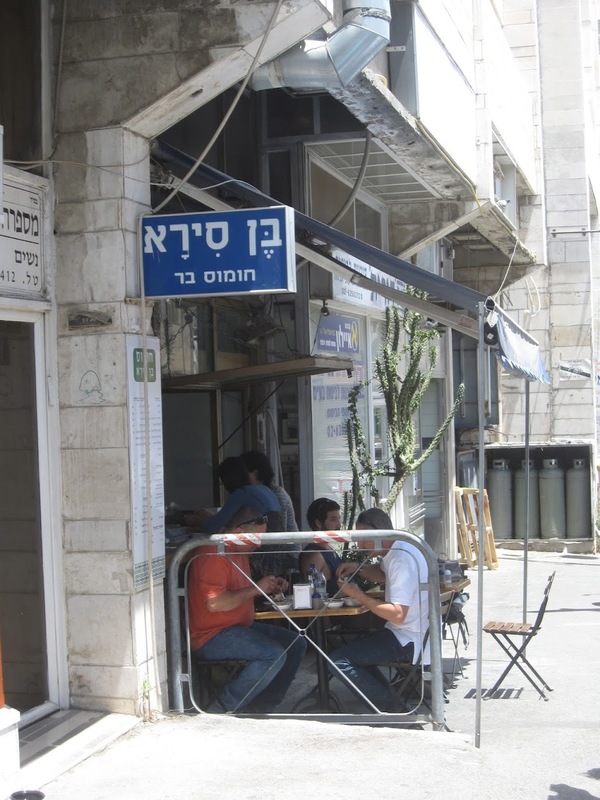 The place we visited is called the Ben Sira Hummus Bar, which is named for the street it's located on. There are three tables outside on the sidewalk and a row of stools at the open window that leads into the restaurant. My cousin went in and ordered for us while we soaked up the sun outside. 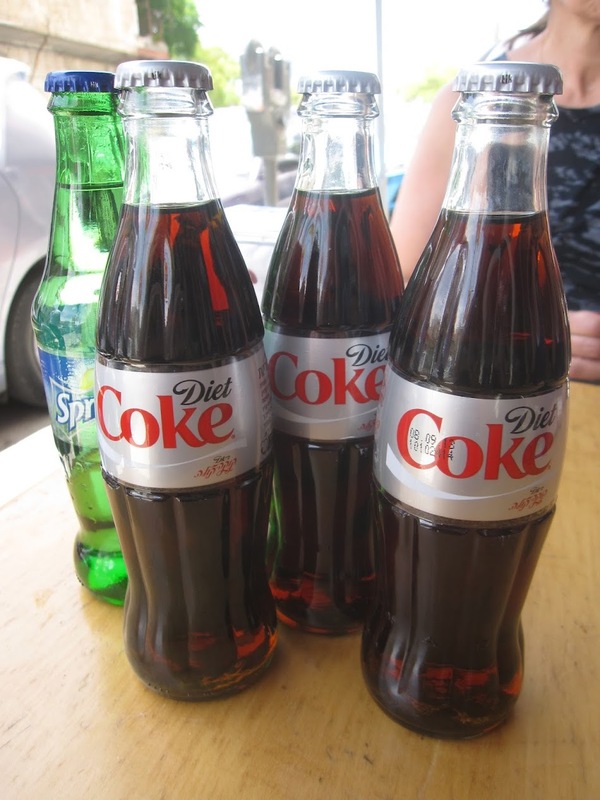 We clinked and toasted with our glass bottles of Diet Coke. Glass soda bottles will never get old to me. It's so retro. At Ben Sira Hummus Bar you can order your hummus plain or with toppings. My cousin topped his with beef. His sister topped hers with mushrooms. I went plain Jane and got the original. It's hard to tell from these close up photos, but there is about two full cups of hummus in those bowls! 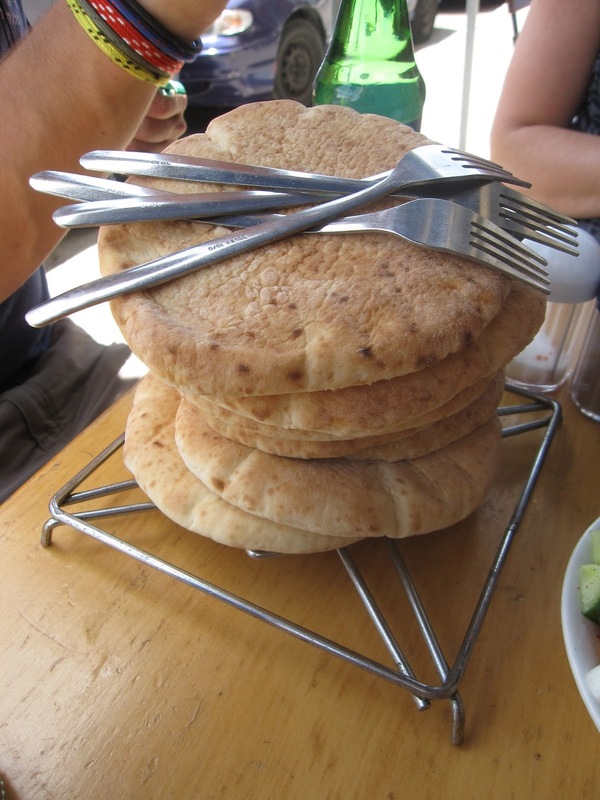 Along with our hummus we were delivered a leaning tower of pita! They also gave us a bowl full of fresh veggies. I wasn't sure what we were supposed to do with them until my cousin shouted at me, "You dunk them! Duh!" We also noshed on a bowl of traditional Israeli salad which is primarily chopped onions, cucumbers and tomatoes, with very little lettuce. About half way through our bowls of hummus, my cousin suggested we also order falafel. The thing about falafel in Israel is they don't even fry a batch until you place your order. It is as fresh as fresh can be and it makes a world of difference. This falafel was the best I had the entire trip. The hummus at Ben Sira Hummus Bar was unlike any I've ever had in the U.S. It was so creamy and just had a totally different, lighter consistency. Paired with the warm, doughy pita and the freshly fried falafel, I was in heaven. After the hummus food coma, my aunt and I walked into the old city of Jerusalem. We headed to a building called the Austrian Hospice, which is part hotel, part museum, part event space. The coolest part of the Austrian Hospice is that you can walk up to their roof deck and take in the view for free. 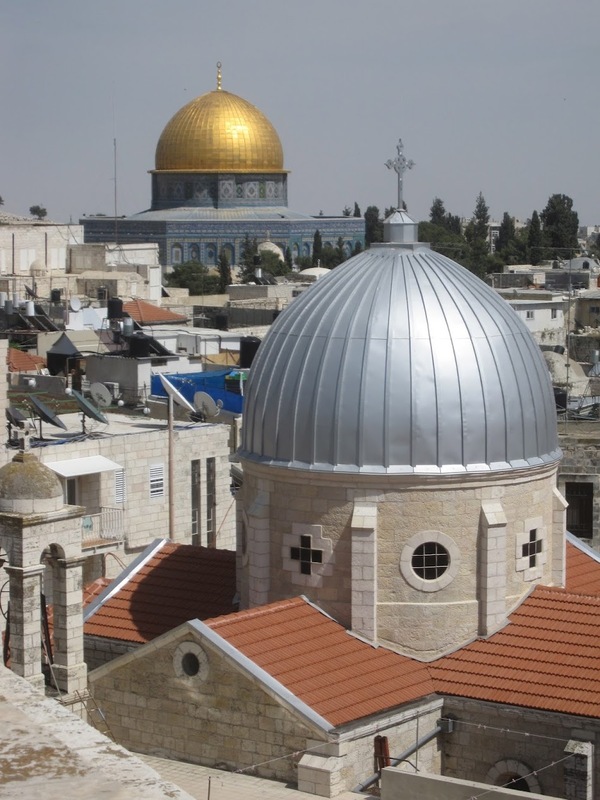 You have an unobstructed view of the entire old city, including the Dome of the Rock. It was incredible. I couldn't stop taking pictures. If you are able to visit Jerusalem, this is a true hidden gem (and a free one to boot!). In the next post I'll share with you an amazing art installation we saw in the old city that is actually coming to Boston in August! Stay tuned. You're totally killing me with this post. It's one where I can not say "oh I can get that in NY." TAKE ME TO THE HOLY LAND OF HUMMUS!!! !